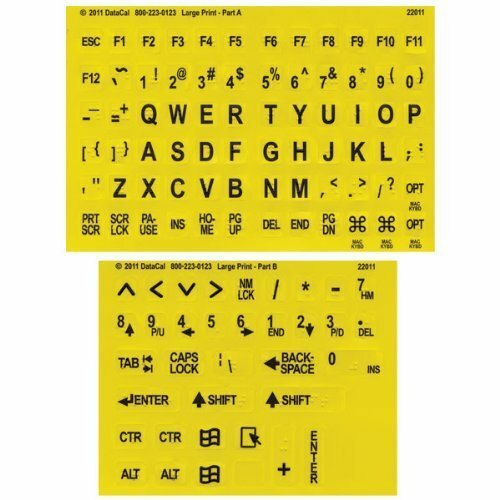 Braille and Large Print English Letters Computer Keyboard Stickers - Overlays - Labels for the Blind & Visually Impaired. Yellow Stickers with Black Letters Designed for the blind and visually impaired, including those with Macular Degeneration, this easy stick label kit is a convenient and affordable way to adapt any computer keyboard to suit your vision condition. The stickers provide Braille characters as well as easy-to-see big print letters displayed in high contrast black on a yellow background. Each sticker is die-cut to fit the key tops of both desktop and notebook keyboards and have highly aggressive adhesive that creates a durable bond with the keycaps. The stickers use an easy peel-and-stick method to install. The stickers use an easy peel-and-stick method to install.. Large Print Braille Keyboard Labels- Yellow Keys With Black Characters. Braille stickers are a very economical option for creating a Braille keyboard. The stickers provide Braille characters as well as easy-to-see big print letters displayed in high contrast black on a yellow background. for Visually Impaired Individuals, Low Vision, or Low Light for Seniors and People with Bad Vision! Durable Lexan® They won't tear, crack, discolor, or slip off even after years of use. The Reverse printing applies the ink underside of the label so the INK NEVER WEARS OFF OR SCRATCHES OFF. If you have any questions about this product by AramediA, contact us by completing and submitting the form below. If you are looking for a specif part number, please include it with your message.